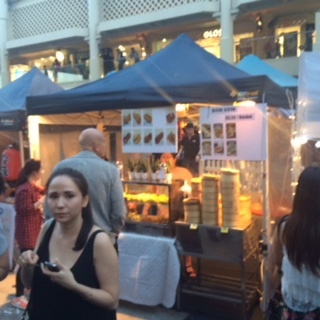 It has been there for a while but I finally made it into town to on Friday of last week to explore and experience the delights of the City of Perth Twilight hawkers market! 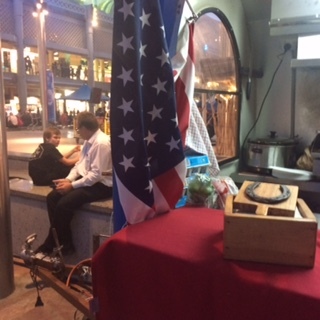 It was a wonderful experience and the different types of stalls on offer was just fantastic! 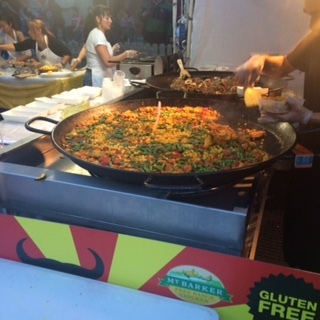 We headed into town after work on Friday and before we decided what to have to eat we wandered around admiring and checking out all the stalls. I think the one thing that really stood out for me was the amazing array of different types of food represented here – there really was something for everyone, whether this was thought out when deciding what to put out there or whether all those that wanted to be part of this food market were accepted was not clear but the plethora of different food options is great! 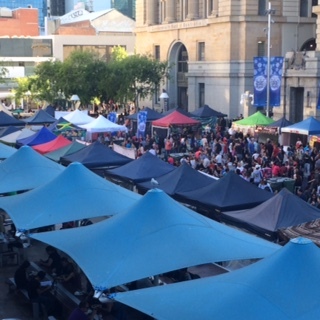 The crowds are impressive too, which means that those running the stalls should all be making money from the experience of being their and this will hopefully mean this will become a permanent fixture every Friday in Perth. I think when the weather gets warmer it will be an even more delightful experience. I would say that one of my only criticisms of the space is the lack of seating. Sometimes with the crowds as it gets later it is harder to find somewhere to sit down to enjoy the food you have selected. Table and chairs will not work as the space is not big enough to do that and the stools that are put out are great, it is just that the seating is really limited and I do like to sit and take in the scenery and enjoy my food and not be forced to stand up to eat it. 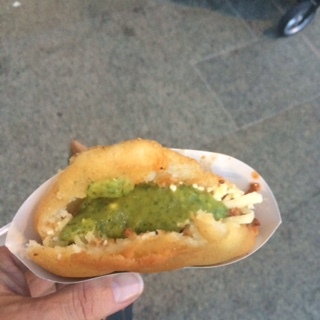 But enough of that…the real star of the night is of course the food. 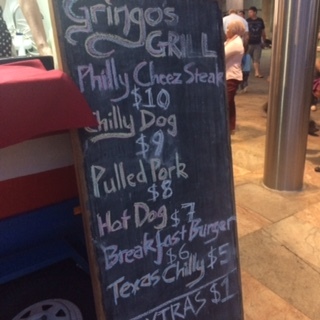 The options are just amazing with the chance to try some dishes that I had not seen on offer in Perth before that sat alongside a range of more familiar fare. All cooked fresh in front of you and as we had headed in early the queues were not yet really long waiting for the food to be cooked and served. 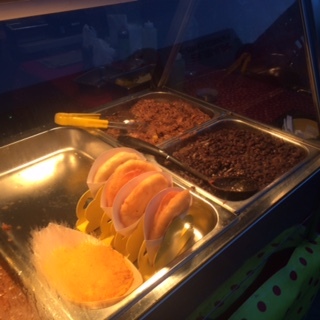 From Spanish to Philippino to Mexican, American, Japanese, Chinese, Spanish, Colombian and so much more the choices are fantastic! After wandering around we decided that we would each pick a dish each to share and then head up to Sassellas for an early evening glass of wine before heading down to taste some more food. Japanese squid balls were my first choice and Trevor chose Moroccan tagine served with cous cous and both were a perfect start to our dining experience. After sitting on the balcony at Sassellas enjoying watching the crowds gather to select their food and having a glass of wine as the sun set we headed back down for the next taste sensations. The choice really are large and so it was tough to decide what to have next, and we chose to have corn muffins filled with chicken for me and beef and chocolate for Trevor. Bother were delightful and served hot and fresh. 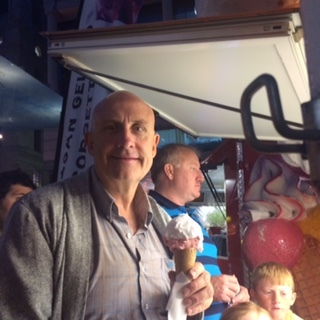 Then it was time to go to the US van and have a Philly Cheese steak sandwich and then over to the gelato stand for some simply stunning strawberry and lemon gelato to finish off the night. The crowds had really built up by this stage and with the amazing live band on stage the atmosphere was really fun, enjoyable and filled with all sorts of people just enjoying the food and the music. 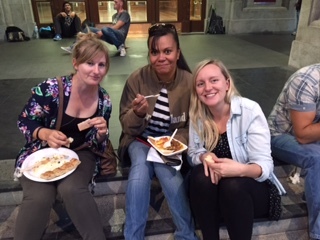 This is the perfect place to bring the kids, your friends, family or just people who enjoy tasting a range of delightful food that you would not necessarily ordinarily have for dinner. 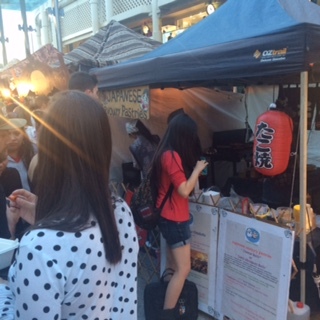 So as Friday once again approaches do yourself a favour and head into the city and enjoy a great evening of casual dinning at the City of Perth Twilight Hawkers market in Forrest Place. 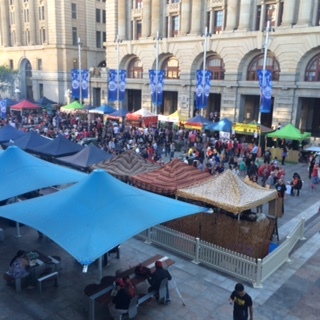 The Twilight Hawkers Market runs from the 17th of October through the summer months up until April. 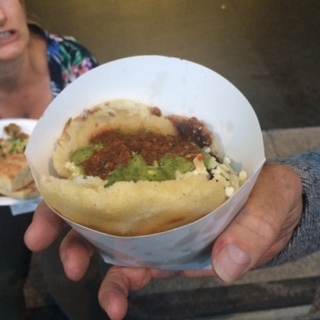 You will not be disappointed but one hint get there early before the crowds get really big and you can spend some time wandering and enjoying all of the stalls. 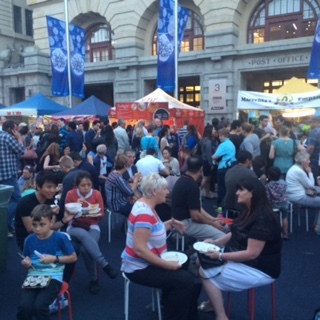 Well done City of Perth for this wonderful initiative We had a great evening and will be back to taste all of the other dishes that we missed the first time round.